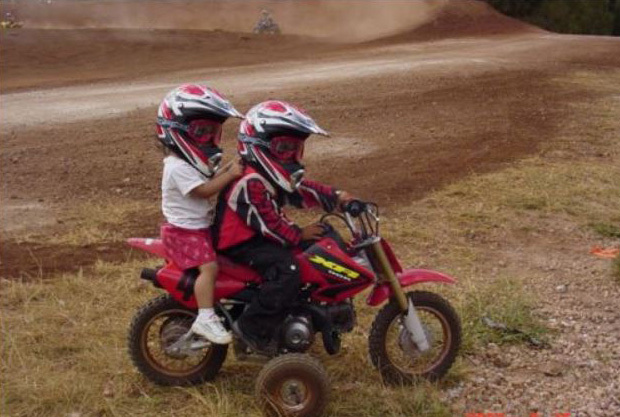 When your child is ready to ride, look no further than EZ Ride in Austin, TX. Our EZ Ride motorcycle training wheels mount securely across and below the minibike's motor. Unlike the generic one-size-fits-all type, our EZ Ride motorcycle training wheels are custom engineered specifically for a number of models. EZ Ride custom designs each training wheel kit to be easily fastened closely to the engine or frame, equipped with the tallest diameter pneumatic wheels and tires, to obtain and preserve maximum ground clearances. MOST IMPORTANTLY - There is virtually NO chance for your child's motorcycle to roll over or shift abruptly from one side to the other when using EZ Ride training wheels. Give your young aspiring child the advantage to overcome that crucial learning curve, to enjoy that motorcycle - quicker, with more confidence and less difficulty - using EZ Ride intelligent design motorcycle training wheels. EZ Ride motorcycle training wheels are designed and built to high quality standards with superior materials and construction while offering unquestioned safety and solid VALUE at a much lower price than other training wheels.